Why does vinyl cost more than traditional wood fencing or railings? Vinyl fencing has become the popular alternative to old traditional wood fencing. Though it costs more at the outset, vinyl fencing pays for itself because it lasts longer and requires almost virtually no maintenance and therefore holds its value long term. You're just not purchasing a fence or railing system! You will be investing into your home. That's why we only use the best vinyl fence systems that are patented and backed by a lifetime guarantee. Vinyl is stronger and more flexible than wood. The GlideLock (patented locking pickets) and SolarGuard (patented UV inhibitors) are exclusive to The Vinyl Outlet Inc. in Western New York. What type of guarantee do vinyl products offer? Vinyl railing and vinyl fence have a transferable lifetime guarantee from the extrusion lineal supplier. Quality Vinyl fencing and vinyl railing systems are made from only the best ingredients to obtain that virtually maintenance free vinyl products. Wood products just can't offer such a guarantee. What type of maintenance will have to be performed? Vinyl is maintenance free, eliminating the need to sand, paint or stain year after year to protect your investment. Does vinyl have an effect on the value of my home and is it the best choice? Vinyl is beautiful in appearance and retains very close to its original color year after year unlike weathered wood fencing or composite decking. Vinyl increases its value because unlike wood it doesn't wear out and need to be stained regularly. This, by far, makes it the best choice. If it's a vinyl privacy fence or a beautiful front porch, the professional fence and porch builders are perfectionist when it comes to quality. Vinyl is value and you can trust The Vinyl Outlet will do it right; everytime! Many people are choosing vinyl fence over traditional wood to modernize their yards and increase the value of their homes. Not only will a vinyl privacy fence give you a beautiful outline to your home, but you can block out those unsightly things that may be in your neighbors' yards. At one point, wood was the less expensive way to go when you wanted to put up a fence. It has come to light that even though the initial investment will be less expensive, the maintenance and repairs on a wood fencing can cost more than a vinyl fence over time. Not only is the vinyl fencing more attractive, it keeps its good looks year after year. You can not get this from traditional traditional wood. A wood fence normally has to be maintained or repaired at least once a year. The vinyl keeps the same look and appeal as it did the day it was installed. To maintain the good look simply wash it with a water and a mild soap once a year. You don't have to worry about temperature changes with a vinyl fence, either. It is manufactured with the knowledge that they will expand and contract. Provisions for this have already been incorporated into the product. Is vinyl stronger than the wood counter part? Vinyl has five times the tensile strength of wood and four times the flexibility. Our Vinyl fence and railing components are engineered with impact modifiers and UV (TiO2) protectants to make our vinyl products strong and Guaranteed against any fading, cracking, blistering or discolor even against Buffalo's toughest weather. Our quality white vinyl fencing is fabricated to hold its color and never need painting. It will not rot, peel, yellow, or warp, and your fence will last a lifetime. The Vinyl Outlet uses full routed and 100% snap together fence design with an aluminum structural reinforcement along the bottom for ultimate strength and wind resistance. The Home Depot and Lowe's carry a low grade vinyl with a very thin wall thickness. They glue the vinyl fence together and rely on this glue, and not aluminum reinforcement, to hold it together. The fence is then fastened to low grade thin wall vinyl post with a plastic fence bracket. This system has proved to have very low wind resistance and is considered inferior by many contractors and most professional fence builders. Home Depot fencing and Lowe's fencing can offer an adequate vinyl fence via their special order program. The special order fence style is a 6 foot wide white vinyl privacy fence section for a much higher price. Compare their 6 foot wide fence to our 8 foot wide elite vinyl privacy fence section; we sell a higher quality for a lower price. The Vinyl Outlet sells only an industry standard common sized full 5x5 post with a .160 wall thickness and a fancy vinyl cap. We can sell our higher quality product with increased wall thickness in our pickets and rails at 20-30% less than competitor prices because we are one of the largest wholesalers of vinyl fencing. You will be buying your fence from professional fence installers and fabricators dedicated to the vinyl fence industry. What is vinyl fence and vinyl railing actually made of and what is the blending compounds? What is the vinyl fence and railings made of and what are the important ingredients in the blending of PVC products? To increase the performance characteristics of PVC, Only the most Quality extrusion companies will add seven different micro-ingredients to the PVC blend. These seven ingredients, combined with superior methods of proper blending, differentiate the best compounds from many others being extruded in the vinyl industry today. These extremely important micro-ingredients address specific needs of a high quality, durable, vinyl railing or vinyl fence system. Heat Stabilizers minimize the effect of heat (solar radiation) on the vinyl fence or railing. Impact modifiers will strengthen the PVC to create a product that will stand up to the toughest weather conditions. A heavy concentration of UV Stabilizers resist the fading of vinyl fence and railing materials caused by the sun's ultraviolet light exposure. Being the most expensive ingredients in the making of a high quality vinyl fence and railing systems is these extremely important micro-ingredients. Titanium Dioxide also known as (TiO2) imparts a brilliant white color to the vinyl and helps to reflect the sun's harmful rays from the finished surface of your vinyl fencing, vinyl railing or deck material. Calcium Carbonates often referred to as a impact modifier or filler. This replaces some of the PVC to increase the vinyl's high impact levels and to increase the very important tensile strength to achieve greater impact from outdoor lawn equipment, sports balls and kids play equipment. This formulation results in superior vinyl fencing products that will not rot, chip, corrode, peel, or blister. Trust in The Vinyl Outlet that we have done our homework to provide you, the customer, with the best vinyl railing you can purchase. As we all know, "the bitterness of poor quality remains long after the sweetness of a low price is forgotten" - Benjamin Franklin. Is your vinyl compound lead free and American made? The Vinyl Outlet is a Buy American fence, railing and deck company. All of our products are made right here in the USA. In countries outside the United States, it is very common to use lead as a stabilizer in vinyl compounds because it is much less expensive then the high quality, and proper ingredients like titanium dioxide used in our fencing, decking and railing parts. 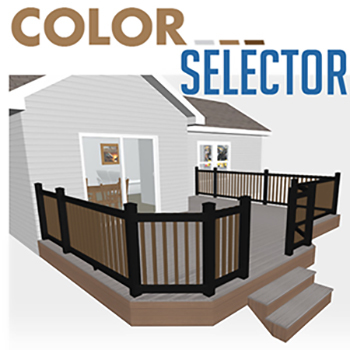 As a professional deck builder, fence contractor and railing installer we take great pride in buying only quality controlled American made vinyl products.